That's the end of Chapter 1! 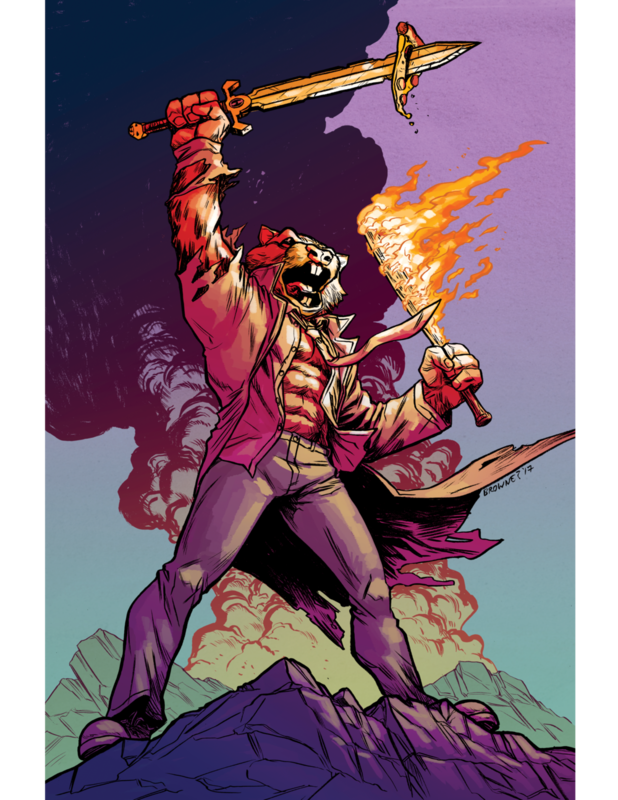 This weekend come to C2E2 and buy the preview copies of the first collected trade of Hamster Rage Chapter 1: Roosevelt VS Everyone! Come see me in Artis Alley F6! Good news Issue #4 is now available on Wednesday on Comixology! Roosevelt bonds with Gram Gram and Shayna, trains with the Allied Force, teams up with MegaBabe to take out the evil Internetz, has a heart to heart with Roboto Muchacho and finally talks with MegaBabe about their history. This is the finale of Conversation! This conversation between the two of them was long overdue! Is it the truth? Is there more than meets the eye to this conversation? What is Roosevelt? Is he the same as her pet hamster? What do you think? Net Neutrality is essential to keeping Hamster Rage alive so I need you to DO THIS NOW! John Oliver has done it again, making it very easy to leave a comment on the FCC website. Instead of following prompt after prompt through screen after screen, use http://www.gofccyourself.com and hit "Express" Then join the 22 million other commenters and write something like: "I adamantly support net neutrality as established and protected by Title II"
Part 3 of Conversation! Roosevelt's dropping some awkward truth bombs here. That conversation between the two of them was long overdue! It's incomprehensible to me that I'm now 2 pages away from number 100! Roosevelt and Megababe are about to learn a lot more about each other. This page features three cameos from my life... the first is IIT where I rebooted my career at a Web Design and Development Bootcamp many years ago. When I first saw the student center I knew I had to turn it into a superhero base. The second is "Icarus 3" a RCAD thesis project I did that was pretty ill considered, but it was an important failure to learn from. Tigron is a character I've been drawing since I was 7. Check out the old sketches of both in the gallery below. This is the finale of Interrogation! Today's colors are by Wes Wong! Next week we return to Roosevelt and Megababe and find out a lot more about the two of them! This is part 3 of Interrogation! Today's colors are by Wes Wong! So General Vayne is one of the aliens that destroyed the Gardens Mall and the Jupiter LIght House way back on page 3. Much more to come with Mood Ring and Bounce Back. This is part 2 of Interrogation! Today's colors are by Wes Wong! This guy General Vayne is one of the aliens that destroyed the Gardens Mall and the Jupiter LIght House way back on page 3. He's a bad dude. Completely ruthless. This is part 1 of Interrogation! Today's colors are by Wes Wong! In the next story we're going to feature Mood Ring and BounceBack. They're doing a deep dive into the aliens that destroyed the Gardens Mall and the Jupiter LIght House way back on page 3. This is part 4 of the origin of Roboto Muchacho! Today's colors are by Wes Wong! Welcome to the all new HamsterRage.com! Special thanks to Ryan Browne for help redesigning the logo treatment and coloring the image I'm using for the background of this site! Please go buy all of his comics! This is part 3 of the origin of Roboto Muchacho! Today's colors are by Wes Wong! Redoing the website was long overdue and unfortunately a real pain... 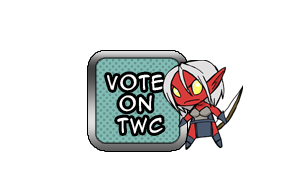 I lost a lot of links, blogs I'd written and other stuff, please help share the comic and get the word out! This part 5 of The 404 Adventure, if you’d like to skip ahead there’s a secret to unlocking the rest of the story on Facebook, Twitter and on this site! SPOILERS! This week’s comic is particularly relevant, if you’ve been following events on social media and in the general comic community sphere there is still an awful lot of cyber bullying happening by Misogynist/Gamergate/Trump supporters and a certain comic book “pro”. This part 4 of The 404 Adventure, if you’d like to skip ahead there’s a secret to unlocking the rest of the story on Facebook, Twitter and on this site! SPOILERS! I had a wonderful time at the Oak Lawn Public Library Fanfest this weekend. My favorite moments are always talking to the kids that want to grow up and become artists and doing my best to encourage them. I’m definitely looking for other smalls shows to start attending regularly so if you know any please contact me! 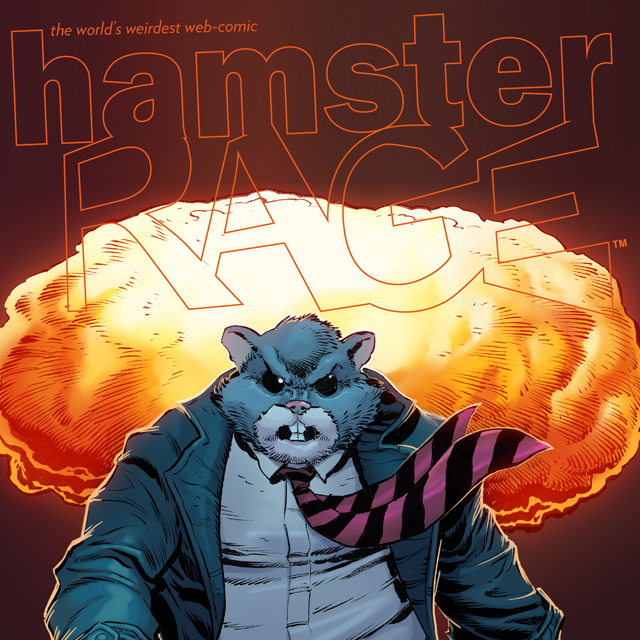 Click this link Wednesday on Comixology, Hamster Rage #3 will be available!